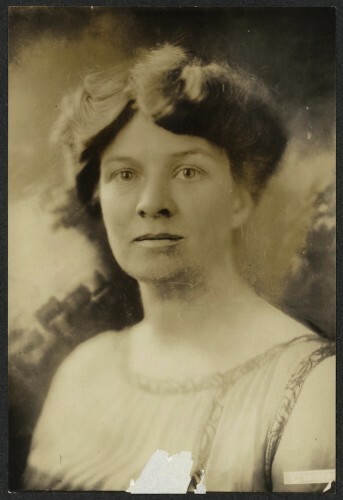 Committed to the suffrage movement, Katharine Houghton Hepburn, known as “Kit,” not only campaigned for women’s right to vote she also advocated for access to birth control and picketed the White House to ensure better working conditions for women. Born in 1878 to the wealthy family that founded the Corning Glass Works, Katharine Houghton grew up outside Buffalo, New York. Her father committed suicide when she was 14, and her mother died soon after of cancer at the age of 36. Kit and her two sisters were placed under the care of an uncle, Amory Houghton, and they had to fight to carry out their mother’s wish that they attend the recently opened Bryn Mawr College for women outside Philadelphia. Her uncle preferred that they attend finishing school but relented, and all three girls attended college at Bryn Mawr. In 1899 Katharine received her bachelor of arts in history and political science and in 1900 completed her masters degree. For several years after receiving her education she traveled and taught at various schools until meeting a young medical student named Tom Hepburn. Although Dr. Hepburn had a successful practice in Connecticut’s capitol city, certain members of Hartford society ostracized the family because of their freethinking and social practices. Subjects such as social hygiene, sexual relations, male homosexuality, and lesbianism were commonly discussed in their household. This did not keep everyone away. Dr. and Mrs. Hepburn frequently entertained artistic, intellectual acquaintances, such as Sinclair Lewis, Emmeline Pankhurst, and Margaret Sanger. Dr. and Mrs. Hepburn were also known to promote the same kind of freethinking in the Hepburn children, encouraging them to question everything. They taught their children that nothing would be handed to them, particularly that which was worth having, and that it was necessary to push oneself in everything—never fearing to try new and daring things. Never timid in speaking her mind, Kit actively embraced woman suffrage and the fight against prostitution in Hartford. From 1910 to 1911, and then again from 1913 to 1917, she served as president of The Connecticut Woman Suffrage Association. During her time with this organization she wrote and published several pamphlets dealing with controversial topics of the day. In 1917 she chose to leave the mainstream suffrage movement and instead supported the younger, more militant Woman’s Party led by Alice Paul, until women were granted the vote in 1920. Throughout the 1920s, Kit volunteered for a variety of causes but devoted the majority of her time to birth control. Her efforts to legalize contraceptives were targeted at perpetually pregnant immigrants, not women of her own class. While she bore six children herself, she understood that for many poorer women bearing children was a burdensome duty, seriously affecting their health, welfare, and psychological development. In 1921 she was the keynote speaker at the American Conference on Birth Control and in 1929 accepted Margaret Sanger’s offer to become the legislative chairwoman of the newly formed National Committee on Federal Legislation for Birth Control in Washington, DC. Though she stepped back from leadership in the fight for birth control in the late 1930s, Katharine Houghton Hepburn remained involved in various feminist causes, including the fight for the Equal Rights Amendment. While she stayed committed to social causes, she spent less time actively involved and, more often than not, offered her name to the causes instead. In her later years, she devoted the majority of her time to following her eldest daughter’s successful acting career and frequently traveled with “Kate” until her death at home in 1951. Jessica Jenkins is Curator of Collections at the Litchfield Historical Society. 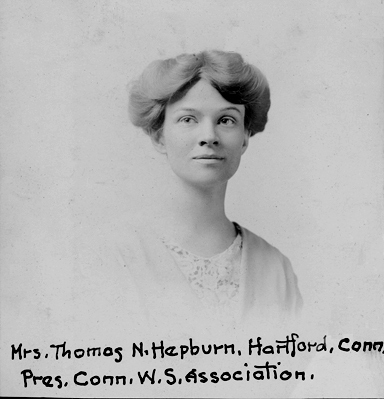 “Katharine Houghton Hepburn.” Connecticut Women’s Hall of Fame, 2013. Link. “Katharine Houghton Hepburn Center - Katharine Houghton Hepburn.” Bryn Mawr College, 2012. Link. “Finding Aid to the Connecticut Woman Suffrage Association Inventory of Records.” Connecticut State Library, 2009. Link. Petrash, Antonia. More Than Petticoats. Remarkable Connecticut Women. Guilford, CT: Twodot, 2004. Hepburn, Katharine Houghton. The White Slave Traffic in Hartford, Connecticut: Some Striking Examples of the Need of Votes for Women Taken from the Hartford Campaign Against Commercialized Vice. Hartford, CT: Connecticut Woman Suffrage Association, 1914. 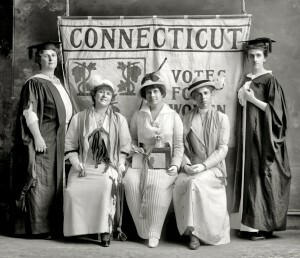 Hepburn, Katharine Houghton, and Connecticut Woman Suffrage Association. What Kind of Men Want Women to Vote, and Why. Hartford, CT: Connecticut Woman Suffrage Association, 1913. Hepburn, Katharine Houghton. Woman Suffrage and the Social Evil. New York, NY: National Woman Suffrage Publishing Company, 1914.